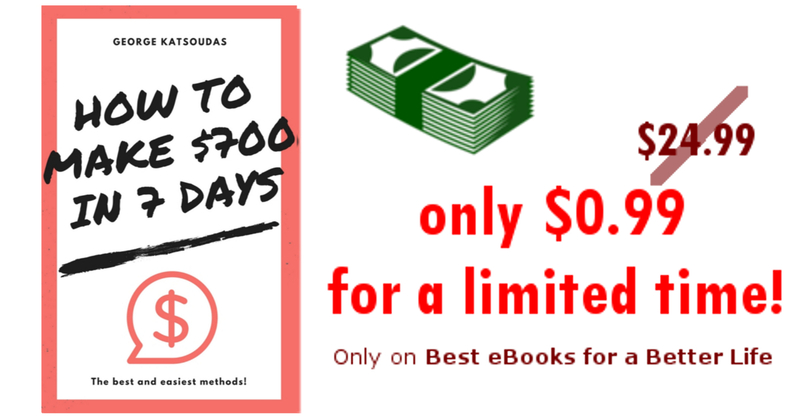 The Best eBook for learn how to make easy money! Only $0.99 for a limited time! 7 Ways to Make $700.00 in 7 Days. Combine all 7 Methods and That's $4,900.00! A) I'm NOT Going to Over Hype This. B) I'm NOT Going to "Bribe" You. Yep, that's right, I'm not going to bribe you with a bunch of bonuses or I'm going to give you nothing but SEVEN (7) purely Profitable ways to make $700.00 or more a week! C) I'm NOT Going to Show Proof. Yes, as shocking and weird as it may seem to read that, I won't do it. I'm NOT going to Razzle Dazzle you with all types of insane screen shots or videos of my Clickbank, Paypal, 1ShoppingCart or Merchant account sales. Besides, even the most green of newbies realize that screen shots do nothing more then stroke the egos of both buyer and seller and help us dream bigger fantasies, right? So instead of giving you proof shots, I'll give you 7 hot ways to make you $700.00 or more a week and you'll love Every Single One of them. I WILL Give You 7 Way to Make Big Money Online. And what's more important is that each of the methods that I reveal to you can be used over and over again to bring in thousands, tens or even hundreds of thousands of dollars or more over time. Each method has the so-real potential to evolve from mere revenue streams used to pay for luxury cars, pricey mortgages and lavish vacations to significant streams of income for your business, complete with repeat customers and a continuously growing "Profit Pond" that you can fish big fat checks from over and over again. It's Also For The Newbie who may just be getting into Internet Marketing and is looking for real life, No B.S., Step-by-Step instructions on how to bring in enough money to live comfortably and prove to yourself that it CAN be done! Before I decided to release this report, I asked a few online marketers to take a look at it and give me their honest feedback. The reason why I did this is because I wanted to make sure that your "How to Make $700.00 in 7 Days" report was as good as it could possibly be, and it is. But, when I started reading, I realized that James values the same business principles I do -- that he strongly recommends building a solid business base. He then goes on to give a great overview of the different business models available in online marketing. This is the kind of guide I'd like to have looked through many years ago. In other words I read this with a completely open mind. The first thing I would say is that the book is well thought out. What makes it different is that George doesn't take the normal stance. He will give an example and then tell you what not to do with it, which is normally the advice given by many. He doesn't just tell you what to do and what not to do, but gives the reasons for it. For some who have been using some of the ideas for some time, it will be worth reading because George will show you why that idea can't be sustained and what to do in place of the old idea.